Although T-Mobile’s executives have made it clear they don’t place any value RootMetrics’ network performance reports, it’s encouraging that the more recent results are finally catching up with what we already knew about the company’s LTE: It’s fast. In RootMetrics’ most recent Midyear Mobile Network Performance Report, compiling data from across the entire U.S., T-Mobile is finally gaining ground and has finished above Sprint. With an overall score of 71.5, it was 1.9 points above its old rival. It still has some way to go before it catches up with AT&T, whose network finished on 79.5, a full 8-points ahead. Verizon was further in front with an impressive score of 81.6 (10.1 points ahead). 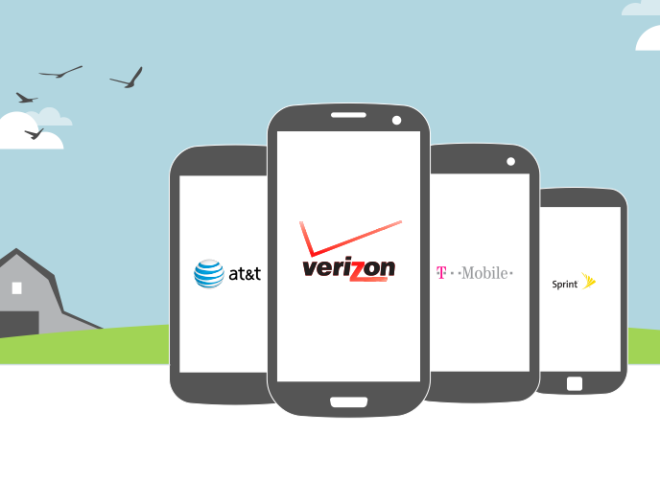 In virtually every category, Verizon was the outright winner across most states. So it’s really no surprise to see the company still having a reputation for having the best network performance among regular consumers. RootMetrics’ report would seem to back up that reputation. With T-Mobile billing itself as the “data strong” network it was worth checking up on the Speed Index and Data Performance results. With having wideband LTE activated in a number of metro areas, boasting real-life speeds of up to 100Mbps in some, it’s no surprise to see the overall speed index results closing in on AT&T and Verizon. T-Mo was a full 10 points ahead of sprint in the Speed Index chart. T-Mobile’s improvement is also clearly seen when looking closely at how it compared to Sprint in our last study versus this round of testing. In the second half of 2013, T-Mobile finished last in five out of our six categories. This time, T-Mobile jumped over Sprint and finished in third place in four categories. While the separation between the bottom two networks was small in most categories, T- Mobile did clearly outperform Sprint in our Network Speed Index. Sprint’s bottom-ranked finish, however, could be short-lived: as Sprint continues its tri-band SparkTM rollout, its speeds could shift into a higher gear. As I type this, I’m aware that T-Mobile is already rolling out its 700MHz network, and is activating some 1900MHz LTE in others. With that being the case, I can imagine next year’s report showing further improvements in all areas including data performance, and overall reliability. Areas where T-Mo sometimes struggles at the moment. For the full report, head on over to the full PDF report. Nicely done but T-Mo needs to get their a$$ in gear with eradicating EDGE. There is good signal in “rural” areas for phone calls but EDGE is unusable. “These towers don’t operate on sunshine and good intentions” best comment yet…. love it ! ! ! Oh I was confused because I though legere said ALL towers but maybe I read it wrong. That’s nice. There are plenty of areas here in PA along MAJOR roads (PA Turnpike, I78, I81, I80) that are EDGE only. And everyone else has #G or LTE. So, yeah they need to get their a$$ in gear. Again, sorry they haven’t gotten to your neck of the woods yet. They are working on it. You may have LTE where you want it sometime between tomorrow and next year. They are currently upgrading other locations that maximize their profits. Fastest & Strongest Network in my area. (Suburb of Boston) Happy to be a long time customer of T-Mobile. Now we need devices that support 700mhz and may be an app for WiFi calling for unlocked devices. That second one will never ever happen. Not a chance. Extremely low level hardware access is needed to the SIM card, and Android won’t allow that in an app. What T-Mobile REALLY needs to do is complete their nationwide LTE deployment on AWS. And slap a 700 MHz radio/antenna on every tower they can as well, so they can light up long-range LTE everywhere they get a license for. PCS LTE is nice, but they’ve got more AWS spectrum. Agree they need to put that 700 mhz band they bought to work .. I have tmobile i love my brand new g3 but hate no service in malls here in los angeles and many other buildings. Att on the other hand gets signal deep in the same buildings T-Mobile has nothing. I think because att uses the 700 band for lte and 850 for 3g. My mom has att she let me borrow her att g3 and from what i saw att is not bad at all as many people make it out to be data is fast about same as T-Mobile up to 30 mbps which is same as tmobile gets here in LA. Call quality is fine no dropped calls and signal deep in buildings . Only problem no unlimited data. . If they had unlimited data i would of been with them cuz honestly now that i tried it its not bad at all as people made it out to be. aw dam n i berly bought my g3 last week i should of wait . How can I find out what carrier is putting up a new antenna close to where I live. I’m hoping it’s for t-mobile because I get poor reception where I live and no reception at my parents or my brothers house. First find out if your community even allows new antennas to be installed. You can check permit requests. I’ve called already. Oh this will only get better once all towers are converted to LTE and 20×20 deployed watch out Verizon/AT&T. It’s not 40×40 in most areas. 20×20 for sure, but not 40×40. You also need a new phone. Tmobile is going to be the best carrier, it’s just a matter of when. John legere saved them and as long as he’s in charge they will thrive. You mean 600MHz spectrum auction next year. It’s 600 MHz spectrum, and given today’s pushback by some broadcasters, I’m not satisfied that the 600 MHz auction is going to be all that successful. I think T-Mobile’s money will be better spent buying up the 700-A licenses currently owned by squatters, who will need to find a buyer before they get penalized for not building it out. T-Mobile? They are like that in most of the state. Can’t speak for it all but bay area to porterville is speedy. They’re 2-3 points below tmo. Really? Even after the new 20GB plan introduced, Sprint corp store is still quiet while T-Mobile corp store on 34th Street is busy like HELL.